Does Your Dog Need a (Second) Coat? | Woof Report | The best email newsletter for dog lovers. Does your dog need a coat this winter? Some breeds are more susceptible to the elements than others; learn if your dog is one of them. As snug as a dog may look in his full-length fur coat, many dogs still need an extra layer of outerwear when getting out in winter’s chilling temperatures. According to last week’s article from Gwendolyn Bounds in the Wall Street Journal, certain dogs benefit from wearing a coat, sweater or fleece when heading outdoors in the cold. From the article, here’s a quick recap of the types of dogs that would benefit from dressing for winter, and those that would not. If you’re unsure if your dog needs the extra protection a coat offers, do check with your vet. Small, short-haired dogs and those without a thick undercoat need the protection of an extra layer to help them maintain body heat. Breeds such as the Chihuahua, Dachshund, Boston Terrier, Shih Tzu, Bichon Frise, Miniature Pinscher, and most lap dogs fall into this category. Dogs of any breed that are older or in poor health likely need an extra layer. By helping these dogs stay warm, you can spare their bodies the work of generating more heat, and ultimately preserve their physiological resources. Bigger breeds and those in the sporting categories can typically pass on a coat or sweater. These dogs are bred for life outdoors, which is not to say they should be left outdoors, but it does mean they can withstand the elements without a coat during a walk in cold weather. In fact, outfitting an active Alaskan Malamute, Newfoundland, Husky or similar breeds in a coat can actually cause overheating, even in extra chilly conditions. 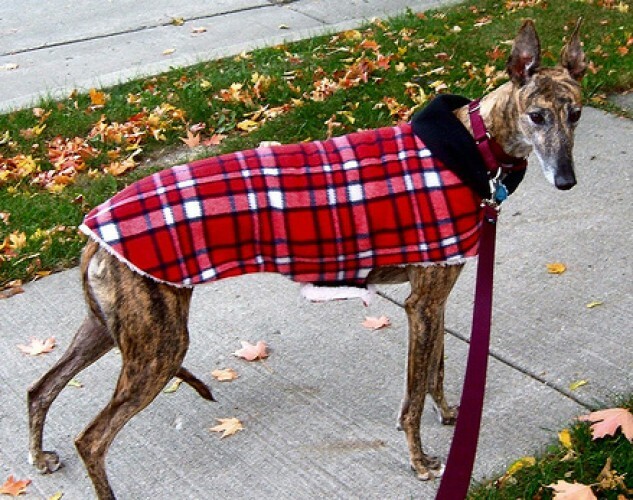 While the WSJ article does not mention the needs of Greyhounds, Whippets and other breeds that carry very little in the way of “insulation” due to their lack of body fat, these dogs are more sensitive to extreme weather and also would benefit from the protection and warmth a coat offers. When you purchase a coat or sweater for your dog, make sure it fits properly – snug, but not tight, and avoid clothing with buttons or other items your dog may chew off. And, of course, look for clothing that’s machine washable. If your dog needs a coat outdoors, he or she may enjoy an extra layer indoors too, so consider a lighter fleece or sweater or even a heated bed for extra winter coziness. Lastly, in addition to outerwear, consider purchasing booties for your dog to protect his or her paws from ice, snow and salted sidewalks. Read the full article from the Wall Street Journal,”Ready for the Dog Days of Winter?” By Gwendolyn Bounds. Thank you to View of the World on flickr for the photo of Needle. Originally published January 2011; reviewed and updated February 2016.